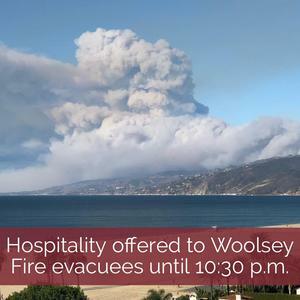 This evening until 10:30 p.m., the St. Monica Catholic Community can welcome evacuees and those fleeing the effects of the Woolsey Fire. We can offer water, snacks and a place to re-group. Unfortunately, we are not prepared to provide overnight services at this time, but can assist in connecting people to services as needed.